Ahhhh...pie. There are few other foods that can invoke such nostalgia and feelings of comfort. Cherry pie used to be my hands-down favorite, and I would often turn my nose up at the pumpkin, apple, blueberry, or custard type varieties (which did not mean that I did not eat them, mind you). I would look for it at every party, in every diner dessert display case, and Hostess cherry pies were a conveniently handheld guilty pleasure at every gas station stop. But, like so many other foods that weighed heavy in my "life before listening" (i.e., the decades before discovering my gluten allergy), reforming my diet included eliminating those as an option. Not that pie was no longer an option - it was more the excess sugar, the fat, the artificial colors, the preservatives, and the filling the void within with meaningless calories. So, needless to say, it's been a long time since I've had pie. That is, until a few months ago when a friend invited me over with the promise of a pie baked specifically for me. Not that that would be what it took to get me over there, but it certainly was a nice gesture. So I agreed, and when I entered the front door, I immediately was taken with the grounding aroma of baking. Of golden pie crust perfection. Of home. The pie my friend made. Wish this was scratch n' sniff. 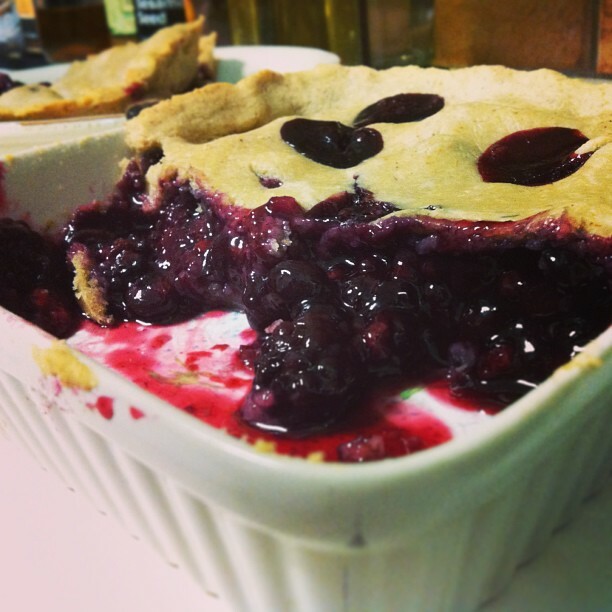 He had made three separate triple berry pies: one vegan, to gift to some friends, one mostly vegan except for the egg wash on top (for him and the other friends there), and then one specifically for me, with a gluten-free, grain-free, and vegan crust. With the first bite, I was immediately transformed back into the pleasantly plump youth with both hands pressed onto the refrigerated pastry case glass. It was so good. And when my friend tried it as well, just to see how his experiment fared, he said that he actually liked it better than the ones made with wheat flour. Definitely a proud papa moment for him. So taking the recipe that he had used as an experiment, I continued to play with it from there. And these galettes - rustic little fruit tarts of the crust wrapped up around the fruit - was the beautiful result. 2. Combine all dry ingredients in a food processor or into a large bowl. Process for a minute or so until thoroughly combined, or if in a bowl, whisk to combine. 4. After resting, the texture will be more like play dough. If it feels too crumbly, you may need more moisture to bring it to a workable consistency, and thus the three extra tablespoons of coconut milk beverage. Add one tablespoon at a time to bring it to a sturdy dough that you can roll out. 5. I found that the best method for rolling the dough out was to sandwich a golf-ball sized dough portion between two sheets of parchment paper. Using a small rolling pin, roll the dough from the center until you have a thin, rustic circle of dough approximately six inches in diameter. 8. Once galettes are ready to bake, brush with coconut milk beverage, sprinkle with more coconut crystals if you'd like, and add about a teaspoon of coconut oil on top of the fruit. 9. Bake for 15-20 minutes, looking for a sandy golden brown color with darker edges for the crust, and small bubbles for the fruit filling. 10. Allow to cool on baking sheet for 5-10 minutes to set, and then serve and enjoy. Fresh peaches in season is a glorious thing. No need to be too dainty - the dough is quite forgiving. Think of the dough embracing the filling and keeping it safe. Done and ready for a fork. Just so you know, the texture of the crust is not your typical pie crust. It is not flaky nor shortbread-like in the slightest. It actually is more reminiscent of a slightly sweet cracker or a sturdy flour tortilla, which I know sounds strange. But trust me when I say that it works. As I've noted in the directions, the durability of this dough is astounding to me. The second time I made it, I was not able to get to it for nearly four days. But pigheaded and curious as I can be, I used it anyways, bracing myself for an epic fail. But it was not that way at all - it tasted nearly identical. And when experiments with freezing the dough, and even freezing fully formed galettes came out with equally awesome results, I was sold. Peanut butter banana empanadas à la mode using the same recipe. I hope you'll enjoy this recipe as well, filling it with whatever seasonal fruit filling, or even savory fillings that you choose. In the photos, you will see that I also made a tastebud thrilling grapefruit and kumquat galette, and I'm already looking forward to Halloween when I will make spiced pumpkin empanadas for dessert...or perhaps black bean and sweet corn mini tartlets....or sweet potato, spinach, and mushroom pot pie.... As you can see, the possibilities are truly endless. Let your imagination light your path. I made a vegan galette using buckwheat flour for the crust and frozen coconut oil to mimic butter. It turned out like a graham cracker, crusty yet buttery at the same time. Your version looks good too though it bit more complicated with so many flours! the number of flours is used to approximate an all-purpose flour, so you could simply sub in one or two flours in place of them - the results would be different, but no doubt still delicious!